Here in the bowels of ArtFest HQ we’ve received a few questions about how to hang work. So, while far from a definitive guide, here’s a few pointers that we hope will help. You’ve been working hard and have got some awesome work prepared and ready to go…but how are you going to hang it? Firstly, a gentle reminder that you are not permitted to hang or attach anything to the marquee structure itself. All work needs to be hung on the fencing provided (unless you have a 3D pitch, in which case you’ll need to use a table or similar). With that said, there are a number of approaches to hanging – each method has advantages and disadvantages and may be more or less appropriate depending on the size and weight of the work. You can buy these relatively cheaply from loads of places – online or at DIY shops. You will need something on the back of your work to attach the cable ties to. 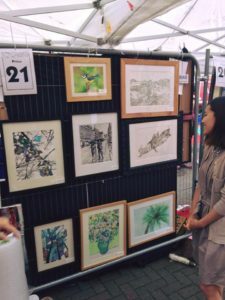 They can be a bit awkward as there will be work displayed on the other side of the same wire fence panel that you have been allocated – so you need to be very careful (and considerate) not to damage another artists work. If you sell a piece, you’ll need scissors or snips to cut the ties to remove your work. You can buy these pre made from hardware or DIY stores or fashion your own out of strong wire. You will need to have wire, or flat eyes, on the back of your frames. 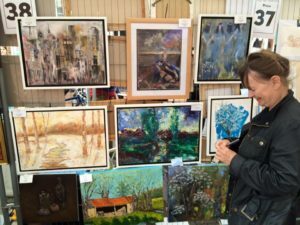 A lot of artists prefer these as it means it’s easy to hang and remove your work without affecting the artist on the other side of the fence. If your work is light, you need to be very careful to make sure that it’s adequately secured. If your work is heavy, you need to make sure the hooks you use are up to the job! Great for small works, clip them to a washing line/ribbon/string or directly to the fencing – just be careful not to damage your work! Also great for clipping up a few business cards! At a pinch you can use wire or string to tie your frames to the fencing. Bulldog clips or similar are also a handy thing to have wth you.